The machine washable Bowron FleeceEase sheepskins aren't just for getting a better night's sleep, they're ideal for your favorite chair, car seat, or anywhere great comfort is desired. Our Fleece Ease sheepskins are tanned by GL Bowron in Christchurch, New Zealand. They consist simply of a premium grade extra large Australian sheepskin (sometimes New Zealand) with no backing. 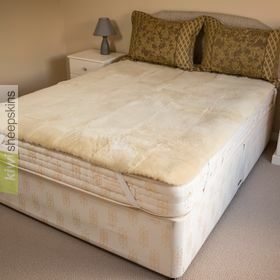 Medical sheepskins provide a greatly improved quality of life to those confined to one position for long periods of time. Enhancing the level of comfort for everyday sleeping, sitting, commuting or just relaxing. The natural fibers of shorn sheepskin move with your body eliminating irritating pressure points and allow you to enjoy life to its maximum. As well as providing a luxurious soft feel against your skin due to the natural lanolin in wool. The natural pelt shape and size of the FleeceEase allows it to be easily transported and used for a variety of purposes, even yoga! 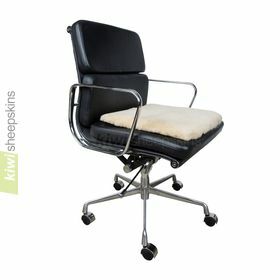 Also consider the smaller quilted-backed sheepskin seat pad which is ideal for just about anywhere you sit. The structure of genuine high density sheepskin allows the body to be supported by millions of resilient and springy wool fibres providing total support and comfort for your body. The natural wool properties of FleeceEase act as a form of preventative medicine, soothing pain and assisting in the prevention of sores. Bowron genuine Australian or New Zealand lambskin has the ability to absorb up to 33% if its weight in moisture, drawing perspiration away from the skin, which is slowly released by evaporation, allowing the body to feel cool in summer and warm in winter. Sheepskin's durability is unsurpassed by other natural fibres and woven wool alternatives. Each pelt includes washing instructions, also see our Sheepskin Care guidelines. 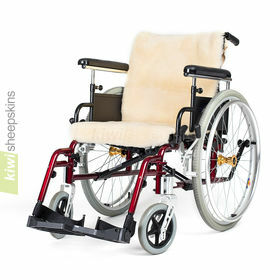 Comments/reviews from our customers who have purchased these Bowron medical sheepskins. I've just received my order yesterday! Thank you very much for the amazing service you provided. I wanted to let you know that I had an amazing sleep last night on my sheep skin! I can't wait to use the insoles in my boots this winter. You have a 100% satisfied customer. Just a quick email to say how impressed I am both by your product and superb service. Firstly my order which was delivered to the Isle of Man in 5 days from order - that is fantastic. I have waited longer for goods to arrive from the UK only 50 miles away. So very well done. 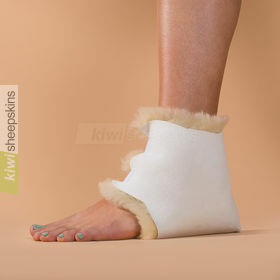 Also the product a Bowron FleeceEase Medical Sheepskin is great. My wife suffers from Motor Neurone Disease and is thus confined to a chair or bed 24 hours a day. Because of the muscle wasting nature of the disease she is in constant pain. But since using the fleece, both in the chair and night on the bed, she has noticed a remarkable lessening of the pain. So thank you once again for a super quality product and rapid delivery. I would not hesitate to recommend both your company and products to anyone. Just wanted to say that the Medical Sheepskin came today and my Godmother is absolutely delighted with it. Your service is first class and I would highly recommend you. Thank you so much. Just wanted to say that my Medical Single Fleece has arrived and it's absolutely beautiful. Thank you so much for your very, very prompt and professional service. Receiving this sheepskin has just made me realize that one of your fleeces would be a brilliant Christmas present for my friend who suffers very badly from Arthritis. Again many, many thanks for everything. Who said good service is a thing of the past!!!!!! Thanks for your amazing service and the wonderful quality of the product. It is for my 96 year old mother who has just had a hip replacement and needs it to prevent bed sores on her vulnerable heels. She is delighted with it. I am so excited! My "lambie" just arrived here in Gladstone, OR and I've already got it on my bed so I can try it out. When my now 18-year old son was born, I purchased a sheepskin rug for him to sleep on. When he started talking, he called it his lambie. I cannot emphasize how much he loved that thing! I got the benefit of using it when we cuddled in my chair, and I always wanted one of my own. And now I do! I'm so impressed with your service, and am amazed that it arrived in nine days. I order books from vendors in the US and it usually takes over two weeks for them to arrive. I will definitely refer Kiwi Sheepskins to anyone looking for sheepskin products. I highly recommend this merchant's website to others. The product I ordered is of very high quality, and the customer service I received was outstanding. Additionally, the product arrived in a timely fashion and there were no problems or surprises when my credit card was billed. Hi! I am delighted with the service I received from you. I live in the UK. Within a week I had my order. The quality and the service was unbeatable. Just wanted to say how impressed I am with your service. Order arrived in one week, beautifully packaged and presented and far exceeded expectations. Is a present for my husband's 17th(!) birthday today (29 Feb) and he is currently asleep under it after a very enjoyable lunch with a bottle of NZ wine! If it's going to keep him this quiet, I'm sure I'll be back for more! Thank you very much.